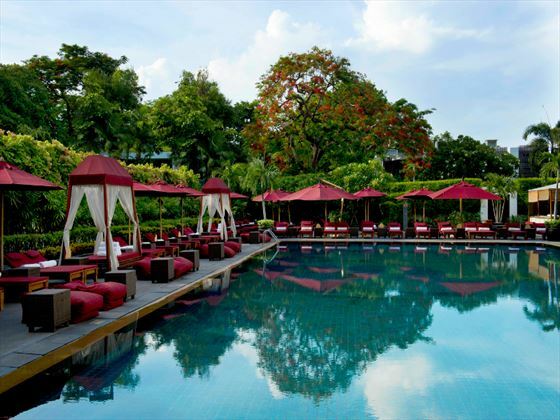 A sanctuary situated in the buzzing heart of Bangkok. Steps away from the business and entertainment districts. Minutes away from all the markets, the river, and all the shopping you’d ever want to do. Your home away from home, a convenient escape from a busy day of being out and about. The hotel thrives on contrasts, each element setting off the next. Spectacular modern facilities and famed service, welcoming you to a green sanctuary that would make you forget you’re in the centre of one of the world’s most dynamic capital cities. 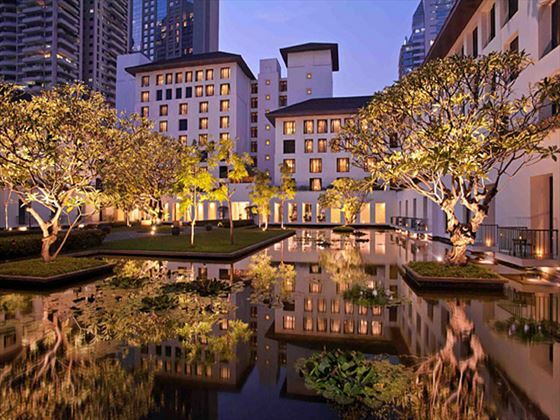 The hotel’s design takes its cue from the ancient city of Sukhothai, with its careful replication of the magnificent stupas and pagodas reminiscent of that graceful age. Interiors are an elegant mix of traditional Thai materials and fabrics reimagined in comfortable modern forms created for function. This harmony of design all comes together to create a hotel that is at once modern and timeless - and always exquisitely Thai. 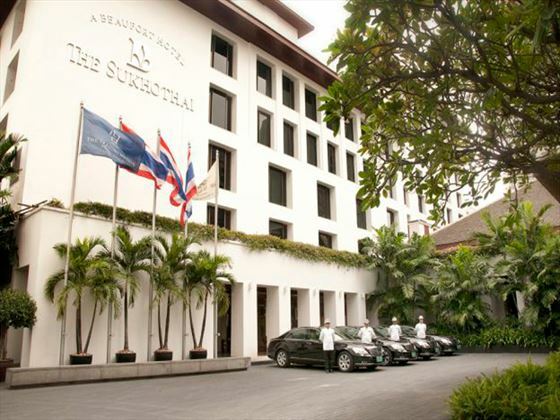 At The Sukhothai, you will find legendary Thai hospitality which has been perfected to an art. 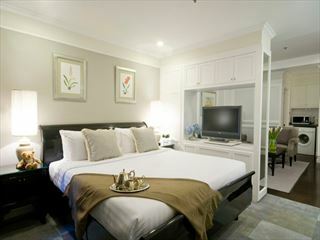 Luxurious Thai accents embellish Superior Rooms. A generous 38 metres in size, teak interiors recall the ancient city of Sukhothai, with striking details and touches that ground you in a sense of place. 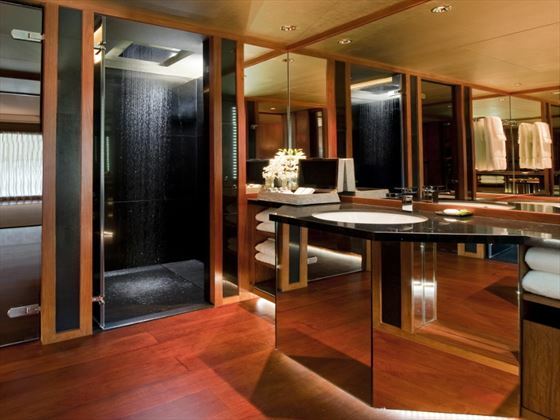 Teak-floored bathrooms with oversized bathtubs and luxurious toiletries complete your Sukhothai experience. Pool and garden views with 45 metres of space. Contemporary Thai with the latest business facilities - a desk, fax machine, stationery kit - all in the comfort of your private haven right at the heart of the bustling city. 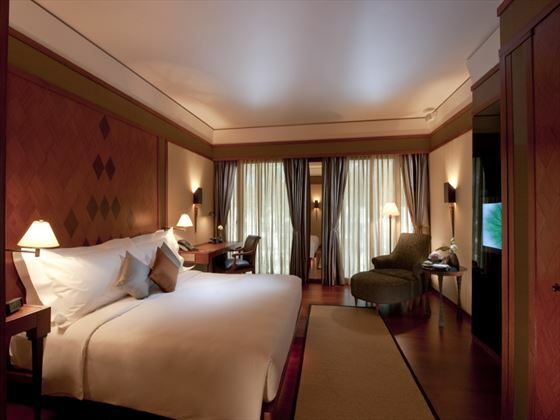 These features and more make our Deluxe Studio Rooms a pleasure, whether for work or leisure. Space for work and for play, and everything in between. At 78 square metres, Executive Deluxe Room comprises an open-plan bedroom and living room combination with two Thai-style sofas and a swivel television which can face either the bed or the seating area. 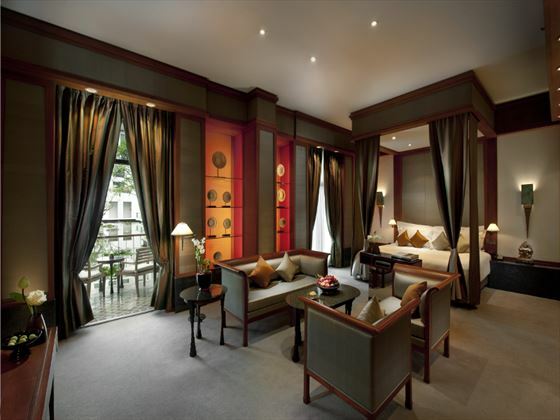 Step into your own private place apart in one of The Sukhothai’s indulgent Suites. 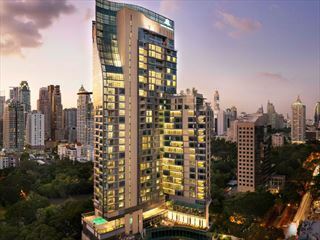 Choose from those with private balconies or sun terraces overlooking the lotus ponds, courtyard garden and pools. 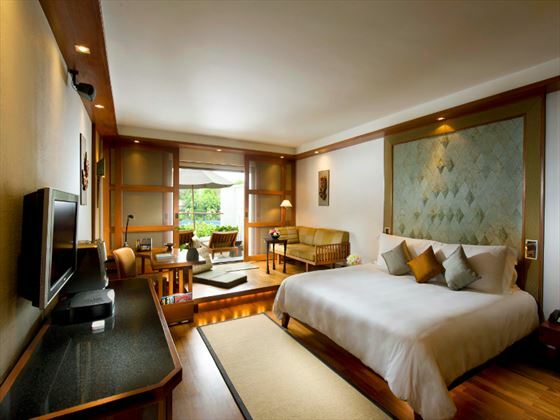 Ranging in size from 66 square metres to an expansive 198 square metres, our Suites allow you to live like true Sukhothai royalty - in fact, many are named and inspired by some of the actual royalty and celebrities that have graced the Suites in the past. Innovative and timelessly traditional spa offerings in a tranquil garden environment. Every aspect of Spa Botanica is natural, from our atmosphere to the products we use. Spa Botanica offers a full range of massage and beauty treatments with private treatment rooms including a Jacuzzi, steam room and private changing rooms. Drift away into your own place apart within the sanctuary that is Spa Botanica. Facilities include a 25-metre (approximately 82ft) long outdoor infinity-edge swimming pool. The adjacent Health Club offers guests a fully-equipped, supervised gym, in addition to Jacuzzi, sauna, steam bath and whirlpool. For those looking for a faster pace, the Club offers aerobic classes in an air-conditioned aerobics room, an air-conditioned squash court and a floodlit tennis court ideal for day or night play. The Venice of the East still lives today. Discover the life - and livelihoods - of Bangkok’s residents by the river. Board a cruise or a ferry at Saphan Taksin Pier for colourful cruises along the River of Kings, which is only a short taxi-ride away. 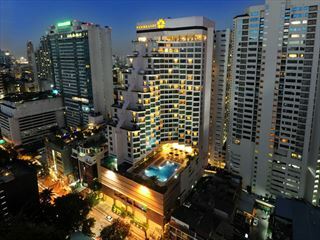 The buzz of Bangkok’s nightlife, just minutes away - a short trip to Silom Road or Surawongse Road takes you to the centre of the city’s famed nightlife, while the dynamic restaurant and bar scene of Sukhumvit Road is easy to reach by taxi, BTS Skytrain or MRT underground train. 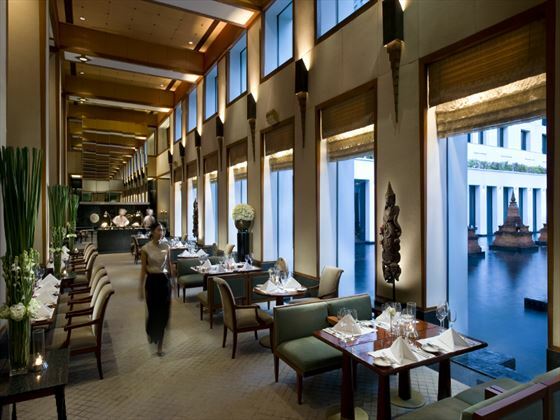 Bangkok is not just a city, but a living showcase of constantly evolving culture and art. From cooking schools, to temples and other well-known architectural and historical landmarks, our Concierge will be happy to introduce you to all the best to do and see in Bangkok. Marvel at the sheer scale and bountiful offerings of Siam Paragon, the largest shopping centre in South-East Asia, home to more than 100 top luxury brands. Its downtown location also puts you within easy walking distance from the city’s other famous shopping malls and districts such as Central World, MBK and Siam Centre. All this, just a 10-minute taxi ride from the hotel. A luxurious 25-metre (approximately 82 ft) outdoor surface-tension, infinity-edge swimming pool, with a spacious pool deck and relaxation areas. Aqua aerobic lessons by a professional and experienced instructor can be arranged. The alluring aroma of Kaffir lime and ginger - a combination that is distinctly Thai. 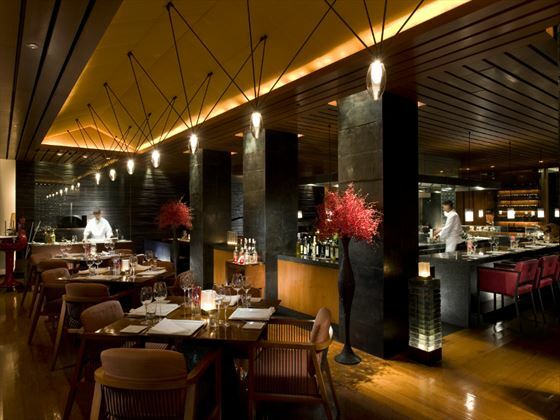 In a city famous for its cuisine, Celadon has made a name for itself as the place to savour delicious Thai cuisine in the capital, prepared the way it was meant to be. Colonnade caters to every whim, bringing the tastes of the world to your table, and offering one of the city’s most celebrated Sunday brunch feasts. Step into La Scala for pure Italian fare with unparalleled creative flair in an atmosphere that is as enticing as the food itself. When evening falls, find delight in good company and a refreshing cocktail prepared by expert mixologists in The Zuk Bar, one of the neighbourhood’s most popular after-work social settings. Meanwhile, on the weekends, The Sukhothai’s famous Chocolate Buffet remains one of the best ways to spend a leisurely afternoon in the city. The Pool Terrace Café & Bar pampers our guests with light meals, refreshing cocktails and fresh fruit juices, making it even easier to just lie back and soak in the beauty of this urban oasis.